We present here a synthesis of the evolution of rifted continental margin systems in the Gulf of Aden. These margins are volcanic to the West of the Gulf of Aden, where they are influenced by the Afar hotspot, and non-volcanic East of longitude 46°E. The combined use of magnetics, gravity, seismic reflection, field observations (tectonic and sedimentological) and oil-well data allowed us to obtain better constraints on the timing of continental rifting and seafloor spreading. From the Permo-Triassic to the Oligocene, the Arabian-African plate was subject to distributed extension, probably due, at least from the Cretaceous, to tensile stresses related to the subduction of the Tethysian slab in the north. In Late Eocene, 35 Ma ago, rifting started to localise along the future area of continental breakup. Initially guided by the inherited basins, continental rifting then occurred synchronously over the entire gulf before becoming localised on the northern and southern borders of the inherited grabens, in the direction of the Afar hotspot. In the areas with non-volcanic margins (in the East), the faults marking the end of rifting trend parallel to the inherited grabens. Only the transfer faults cross-cut the inherited grabens, and some of these faults later developed into transform faults. The most important of these transform faults follow a Precambrian trend. Volcanic margins were formed in the West of the Gulf, up to the Guban graben in the south-east and as far as the southern boundary of the Bahlaf graben in the North-East. Seaward dipping reflectors (SDRs) can be observed on many oil-industry seismic profiles. The influence of the hotspot during rifting was concentrated on the western part of the gulf. Therefore, it seems that the western domain was uplifted and eroded at the onset of rifting, while the eastern domain was characterised by more continuous sedimentation. The phase of distributed deformation was followed by a phase of strain localisation during the final rifting stage, just before formation of the Ocean-Continent Transition (OCT), in the most distal graben (DIM graben). About 20 Ma ago, at the time of the continental break-up, the emplacement of the OCT started in the east with exhumation of the subcontinental mantle. Farther west, the system was heated up by the strong influence of the Afar hotspot, which led to breakup with much less extension. In the Gulf of Aden (s.str), up to the Shukra El Sheik fracture zone, oceanic spreading started 17.6 Ma ago. West of this fracture zone, oceanic accretion started 10 Ma ago, and 2 Ma ago in the Gulf of Tadjoura. Post-rift deformation of the eastern margins of the Gulf of Aden can be seen in the distal and proximal domains. Indeed, the substantial post-rift uplift of these margins could be associated with either the continental break-up, or activity of the Afar hotspot and related volcanic/magmatic activity. Uplift of the northern proximal margin was still active (e.g. stepped beach rocks exposed at 60 m of 2 Ma; 30 m of 35,200 y; 10 and 2 m) and active volcanoes can be inferred at depths of between 70 and 200 km beneath the margin (at 5–10 km distance from the coast). On the distal margin, heat flow measurements show a high value that are associated with post-rift volcanic activity and the development of a volcano (with flows and sills) shortly after the formation of the OCT. The Afar hotspot is therefore important for several reasons. 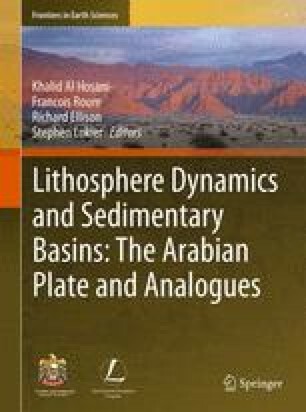 It allows the localisation of deformation along the Red Sea/Aden system and the rapid opening of the Gulf after the continental break-up; its influence also seems to persist during the post-rift period. This study is a contribution due to GDR Marges, Actions Marges, ANR YOCMAL, INSU-DYETI, CNRS-PICS Oman and CNRS-PICS Yemen. We thank Philippe Patriat for stimulating discussions and also Nadine Ellouz-Zimmermann. We are grateful to the Ministry of Commerce and Industry, Directorate of Minerals of Muscat, Ministry of Oil and Gas, GSMRB, French Embassies in Sana’a and in Muscat for their support during the project.